Winter is not only the best season for finding balance, being sick, or paying the highest bills for heating, but it’s also an opportunity to turn your good mood on and spend some well-earned relaxation. So, I decided to turn my “sad Mondays” into adventures and try one by one most of the offerings of the SportPass card. To be honest, I’m not a real fan of sports. Last time I visited a gym, people still called them “sport saloons” and that was 15 years ago, at the dawn of Bulgarian democracy. Instead, I prefer activities such as yoga, spa or dancing once in a while. Approaching 37, I start to see my friends become sport fanatics, trying different activities just to prove to themselves that they are in good shape and that they can still compete with their twenties’ selves. I suppose this craze will soon get me as well, especially given the fact I work in a company where the average age of the employees is 25 But that’s not all. My boyfriend is quite athletic and attends regular rugby practices. For those who are not familiar with the sport, I can assure you that it requires a lot of strength and good physique. Lucky me, right? To contribute to our relationship, I started running, but not in the normal way – I started taking pictures of his team’s plays (and of him of course). To be honest, my favorite part of the rugby game is still the third half – that’s what they call beer time. At those social events everybody shares how they stay in shape. And because I’m chatty and need to keep up with this social circle, on New Year’s Eve I decided to start exploring for myself and understand what makes others so passionate about sports. A really sweaty sport (such as fitness) wasn’t the best choice to start with, so I asked one of my friends who already uses a SportPass card (or so it seems) to recommend something suitable for a newbie. Swimming pool and sauna – it sounded like a good place to start. I decided to name my first visit “There is nothing better than bad weather” for two reason. First is that January weather in Sofia is awful. If you don’t believe me, you can ask our beloved government, which was “surprised” by the snow again as they usually are every January. The other reason is that this is the name of one of the greatest Bulgarian novels by Bogomil Rainov, which I particularly like.So, here we are. We have a terrible streak of cold weather, a SportPass card, a thrill for adventure, and enough willpower to start the body shaping process. Victoria Spa is located in Ramada Hotel or Princess Hotel as the old Sofia citizens well know it. You can expect nothing but luxury and that’s exactly what you’ll get. Unfortunately, from the very beginning, the receptionist informs you that the card covers only one activity – pool, saunas, or fitness. Every additional activity will cost you extra 15 BGN. Next thing that is good to know before visiting, is not to forget your swimming hat, otherwise it will cost you another 10 BGN. For using saunas, you will need a bracelet (most of them are with broken straps) for which you have to leave 10 BGN as deposit fee. 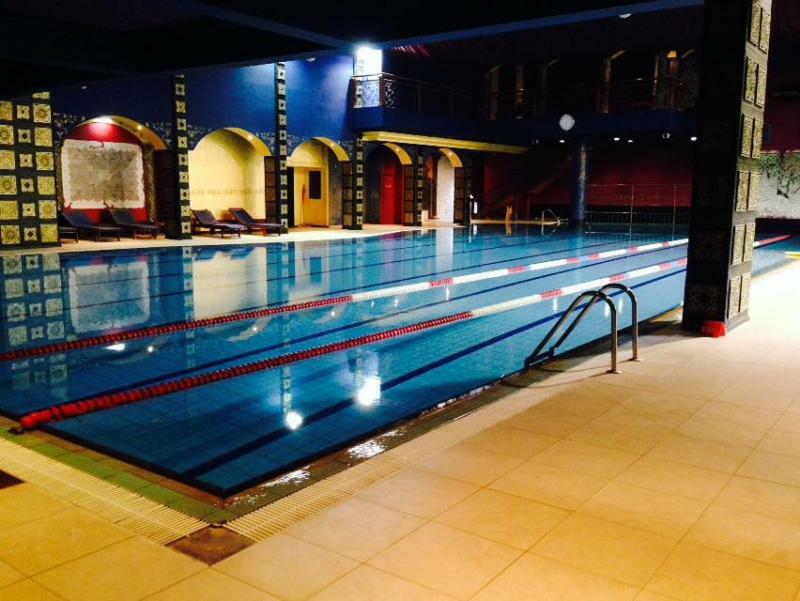 Swimming pool: The swimming pool is big enough for people who enjoy swimming long distances (25x12 m). Unfortunately, it is often too crowded to swim, and it is almost impossible to find a free lane because of the training activities taking place there, including spinning and water gymnastics. Children/small pool: Actually, it was full of grown up people. I didn’t see any children using it during all the three hours of my visit. Thermal zone: There is a classic Finnish sauna, Salt Sauna, steam bath and Turkish bath. I tend to recommend the Salt Sauna, because only after 5 min, for the first time this month I felt like I could breathe through my nose. It’s great for inhalation treatment. The problem is that sometimes there are no salts, so the effect is not the same. Another problem is getting safely to the thermal zone. The way to it is just in between the swimming pools and the showers. It’s wet and slippery almost all time. But once you get there, you can forget about all the efforts. Background: There is a bar with luxury soft sofas and tables just next to the pool. It looks nice, but to be honest it’s weird when people in swimming suits keep staring at you. There is a resting place upstairs as well, but I can’t imagine how you can sit with your wet clothes in there. So, as you can expect, it was actually the least visited place from the whole facility. Visitors: Most of the visitors were regular Bulgarians who go there after work. They were chatty and polite. For example, they advised me to put my feet on an elevated place while in the sauna because it’s easier to stand the heat inside if you are new to that experience. Observation: There is absolutely no wonder why all the visitors there looked happy, calm, and healthy.